The temple of Wong Tai Sin is synonymous to Hong Kong, much more so than the Big Buddha despite the fame and sheer size of the latter. 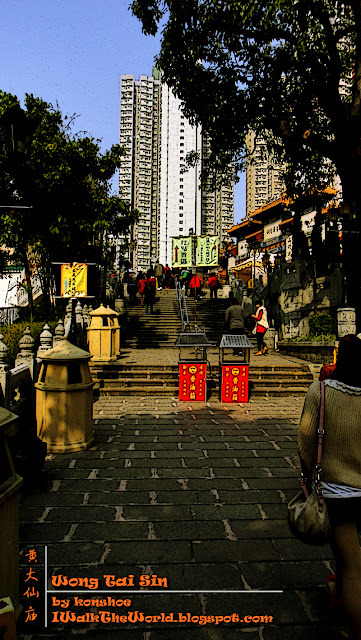 All Hong Kongers know about the temple, famed for being able to grant any wish that is requested (有求必應), and no trip to Hong Kong should skip it, if only to just experience the crowd it draws. Standing in front of the main gates to the temple, it was obvious that that was another crowded day despite it being a weekday. 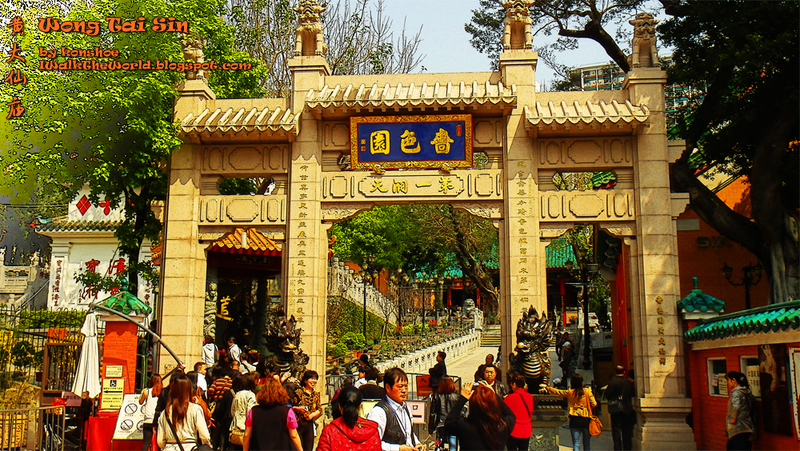 The gate itself is a preview of the Chinese temple architecture expected from my visit. This can be referred to the marking #1 in the map at the end of this article. The main gate of the temple was guarded by two shiny black dragons, dark as onyx and majestic as the sun. Approaching the gates from a relatively spacious expanse in front of the gates could have deceived me of the crowd awaiting me within, for nothing draws people from all over Hong Kong as well as China as the temple that is famed for granting wish. A look at the main gate itself was enough to lend me a preview of what I could expect from this visit. The looming yellow arch stood straight as an arrow and sturdy as a rock, marking the entrance into the temple proper as well as presenting the architecture often encountered in Chines temples. 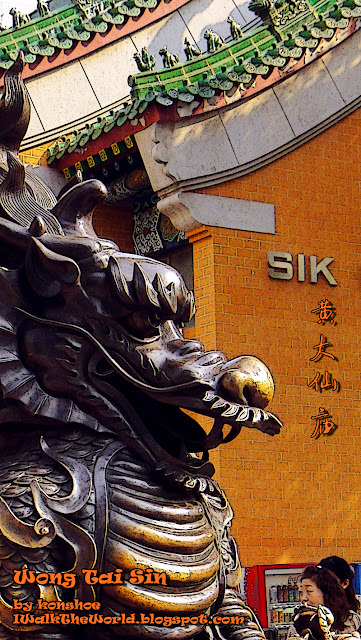 Statues of dragons, lions and other mythological creatures acting as guardians of religious and sacred places dotted the pathway from the entrance and throughout the complex, warding off evil spirits and setting up a protective barrier. A close up shot of the guarding dragon may put it in a somewhat comical position, but I assure you that this statue is no joking matter. Dark as it may, the washed out bronze on the dragon was an indication of how much it had endured in its role as a guardian through the storms and sunshine. The slow walk along the scenic route should have been soothing and calm, but most of the times the jostling crowd makes it anything but. One could not help but notice that even the rubbish bins are modeled as kilns for joss paper burning. Every single detail of the temple complex were given an attempt to fit into the surrounding architecture for a seamless transition from modern contraptions to historical artifacts. This is the path marked as #2 n the map below. 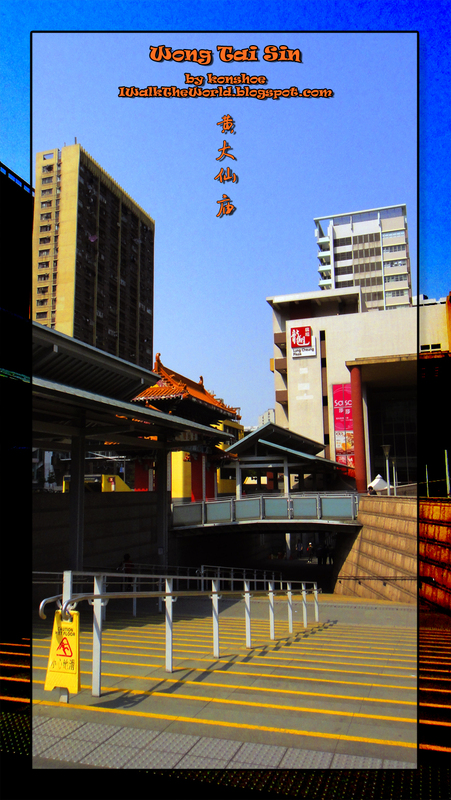 A panoramic shot of the expanse of area before the main gates of Wong Tai Sin temple. The relatively spacious area presented a stark contrast against the claustrophobic crowd which awaits me within. My exit from Wong Tai Sin MTR station directed me from under the tunnel. In hindsight, I actually missed one of the artifacts of the temple, the straight yellow arch with an orange tiled roof standing in the middle of this photo. This is the gate which marks the location of the temple to drivers along the road, and although it is not part of the temple proper, it is a symbol of the temple's solitude as it stood alone, silent and small against a backdrop of sky reaching monstrosities and roaring modern contraptions of the road. The fanaticism Wong Tai Sin temple draws to itself at times can be less religious and more superstitious, mingled with selfishness and greed. The former (superstition) is not a bad thing, but the latter is. There was an instance when I passed by and overheard a lady arguing with the janitor controlling the joss sticks. There was a sign limiting the number of joss sticks to be used per person to control the number of them being placed on the holder. The lady held a large bunch enough for a few people and the janitor reminded her politely that it was not allowed. She was not deterred and continued forward, insisting that she needed more so that the deity will hear her more clearly and grant her wish. It did nothing to harm anybody around her, but such thoughts were selfish and her wish was clearly placed higher than anything else. Map taken from SikSikYuen's website. The area marked #1 is the main gate, whereas the path marked as #2 was taken by me to approach the main altar. 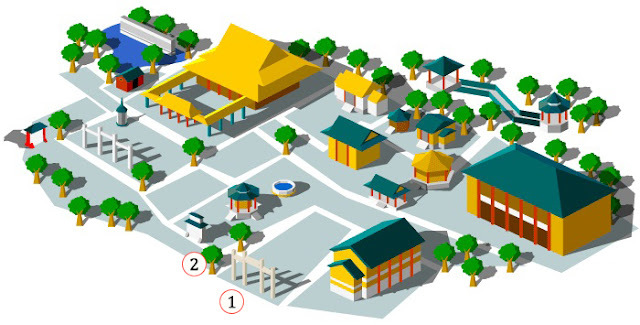 To explore the temple complex, it is possible to take any route you want, since the buildings are laid out in a roughly circular grid. I chose one which brought me directly to the main altar, a gigantic building that is the main attraction of all visitors. My next article will share what I saw in the most famous altar in whole Hong Kong.